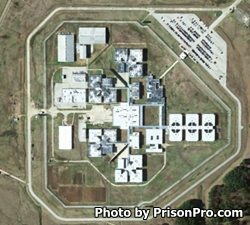 Telford Unit is a maximum security prison located in New Boston Texas, part of Bowie County. Named after former State Representative Barry B. Telford, the prison opened in July of 1995. Telford Unit houses a maximum of approximately 2,872 adult male offenders on 92 acres secured by two twelve foot high razor ribbon wire fences and three armed security towers. Additional security is provided through an armed patrol vehicle that secures the perimeter 24 hours a day. Inmates at the Telford Unit are housed in eight massive living quarters. Offenders who are housed in buildings 18 and 19 live in dorms, while those inmates who are in buildings 3, 4, 7, and 8 are housed in multiple occupancy cells. Additional housing for up to 60 transient inmates is provided in building eleven, while building twelve contains 504 segregation cells. The large number of segregation cells is necessary as a large number of inmates have committed violent crimes/shown a history of aggressive behavior while incarcerated, and are considered dangerous to other inmates and staff. Although a large number of offenders are considered G5 maximum security (approximately 21%), Telford Unit also houses medium (21%) and minimum (52%) security inmates. Telford Unit provides work opportunities for inmates that include farming, working with horses, cows, and in kennels. Additional work assignments include laundry, maintenance, food services, landscaping, and housekeeping. Educational opportunities exist for offenders at Telford Unit, and inmates are encouraged to take courses they may benefit from which include; adult basic education, literacy, GED courses, life skills, parenting classes, substance abuse education, victim awareness, and pre-release preparation. Vocational programs provided at Telford Unit include small engine repair, electrical tradesmen, and carpentry. Before you can visit an inmate you must be on their approved visitation list. Visits at the Telford Unit are conducted on Saturdays and Sundays from 8am to 5pm. Inmates are allowed only one two hour visit each weekend. Visitation closes promptly at 5pm regardless of the time you arrived, so if you show up to visit at 4pm you will not have a full two hours of visitation. Always call the facility prior to visiting to ensure the inmate is still located their and is currently eligible for a visit. Do not bring cell phones in with you to this facility. Telford Unit has vending machines available and will allow visitors to bring up to twenty dollars in quarters contained in a sandwich sized clear Ziploc bag.